Special situations require special solutions. Radiation-resistant doors are important when building a safe environment in medical offices, medical centres or hospitals. For the benefit of people with radiation bypasses, protection comes first. Our wooden lead-lined doors are manufactured for such special operations and ensure an optimal protection for your home. Radiofrequency radiation (RF) is used because of its reach and the rapid expansion of its waves for mobile, radio and TV stations, radar, radio, and also cordless phones, baby monitors, and microwaves. Electromagnetic waves are for wireless data transmission at higher frequencies emitted (100 KHz to 300 GHz), which blends electric and magnetic fields to an electromagnetic wave. Expert estimates suggest that about 70% of the population are affected by health fault zones, without knowing it. The door leaves are provided with optional equipment such as special shielding, which is installed below the surface of both sides of the doors, ensuring effective protection against electromagnetic waves. The frame suitable for this door comes as back-coated with a special film. The ready-built element provides an optimal shield over door and frame. Depending on the frequency range and polarization, a shield achieved is between 98% and 99.9%. The shielding effect is recognised by the Department of RF, microwave and radar technology at the Bundeswehr University in Munich. Radiation shielding is very important, even if people do not give much importance to this aspect. Radiations are important for our modern lives and because of them, we made advances in diagnostic imaging and medicine. However, they can present late effects when not used appropriately, which means that you do not realise it when you are radiated, but after some time, the negative effects of radiation are coming up. For this reason, the areas in which controlled and authorised radiations are likely to happen should be protected in order not to spread the radiations to unwanted areas. So, hospital doors should be lead lined doors, which would absorb the radiations and not let them exit the room. Among the symptoms that people can experience due to radiation poisoning, they include nausea and vomiting, dehydration, bruising, sloughing of skin, open sores on the skin and many other. All these can be successfully avoided by choosing x-ray doors with lead lining for this type of room and by keeping yourself safe and away from unwanted x-rays. Also, our lead-lined doors are made to measure, which means that the doors can fit different sizes of opening. VITALEUM 888 is inside all smooth door panels (except solid), door panels with applied mouldings, as well for all the frames supplied for these doors. Optimum protection can only be ensured if the wall, ceiling, and floor are equipped. Seek advice from your dealer or architects. To ensure a good level of X-Ray protection, this type of internal doors can be equipped with a drop-down threshold mechanism. The drop-down threshold is an automatic door seal. 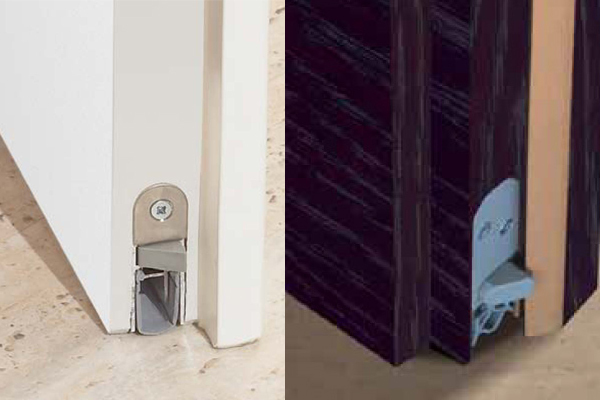 The sealing profile seals the door when closed by pressing it down on the floor. X-Ray internal doors can be provided with any finish and design from our laminate door category. Doors4UK has chosen to work with transport companies based on reputation, so we can ensure that we can get a reputable and reliable transport service and financial cost, no matter how large or small your order is. Most of our products are shipped by pallet due to the size and weight of the wooden and glass doors. The carriage charge depends on the size of the order, goods ordered, and delivery address. Doors4UK is able to manufacture extra wide and tall doors up to 1235mm in width and 2485mm in height. More than that, even wider doors (up to 2400mm) can be manufactured from two door leafs connected on site. Therefore, for those dimensions, the scale of the house is important, as extra wide and tall doors would look silly in small apartments.